Our friends Real Estate have spent the past few years doing it “the right way” – garnering critical attention for the debut LP and building off of that with varied, exciting and packed live shows. Their hard work has paid off in the form of an exciting new deal that finds them leaving one of our absolute favorite boutique labels – Woodsist – for one of the best-curated international indie labels, Domino Records. Per Domino’s press release, a new record is expected in October of 2011. Giving a treat to a Friday night crowd that the band said was one of their best NYC crowds in years, the band played a bunch of new material, including a number of songs we had not heard before. The new songs do not deviate wildly from the old material – call them evolutionary rather than revolutionary – but demonstrate their continuing overall improvement as a band and as songwriters. Ridgewood’s finest will no doubt play some local shows before that new record comes out, and we expect to enjoy hearing more of the new material between now and then. hi and lo recorded this set with the Schoeps microphones in our usual location in the venue. As with the Julian Lynch recording, these accurate microphones picked up a lot of natural reverberance of the wide room. However, the house mix was stronger, and the crowd a bit less chatty, so with additional mastering efforts, this recording is the much better of the two. Enjoy! 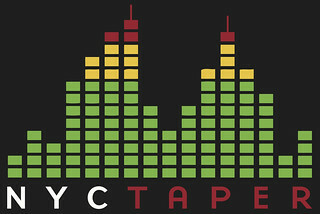 If you download this recording from NYCTaper, we expect that you will PLEASE SUPPORT Real Estate, visit their MySpace page, and purchase their releases from Woodist Records, Half Machine Records, and Underwater Peoples, plus check out their forthcoming release this October on Domino Records. Thank you, saw them twice last year. Great live band. I am extremely excited to listen to this! Thank you so much for this and the Julian Lynch. I am eagerly awaiting the new album. Any chance that you’ll upload the Alex Bleeker set that you taped a while ago? Thanks a million for all the work involved in sharing this excellent recording of a fantastic performance! Many thanks! This is sounding great and getting me psyched for LP2.